Suppose the people of God–the true people–were numbered today; where should I be enrolled? Am I certain that I should be enrolled at all? Just what is my place in the church?–not as men see, but as God sees. For the numbering is going on. Day by day the entries are making in the Great Book. How gloriously was that tent-city laid out! It did not center about Moses’ tent, or Aaron’s or Joshua’s. It did not center about the commissary department or the military. Judah was not made the rallying point. No; its heart was the tent of meeting, and the heart of that tent was the presence of Jehovah. Thus let me order my life, with all its interests; and let me permit no other center. We have no Levites, but we have Levitical work. Who is to do it, but me, and my like? What is my task as a Levite? Have I recognized it? Am I about it? What particular share in God’s house have I? what part in Christ’s kingdom? However small, let me adopt it, and train for it, and do it, for Christ’s dear sake. Wrapped in blue or in purple, what burden has the Lord laid upon me or given in my charge? Does it seem a heavy weight, or a proud delight? Is it a load, or a crown? Beneath that wrapping is some golden vessel of the sanctuary. See! Light and blessing radiate from it. I will walk happily all the day, for very joy of my burden. I need no “water of jealousy” to bring them out. They are bitter within, and ugly already to the eyes of men. My sins find me out. The world soon finds them out. Let me no longer hide them from myself, since they are not hidden from God and His creatures. Let me know myself; but first, O Christ, let me know Thee! The benediction of Aaron upon his people is a benediction upon me also, for is not their God my God as well? And He has promised to bless me and keep me. His shining face is graciously turned upon me. In the light of His countenance I find my peace. Oh, let me never wander away from it! It has been set up by the Almighty. It is dedicated to Him. As the flame and smoke ascend from it, they shall be the bond between earth and heaven. But how are they the bond between me and my God? Only as I give my life for the altar; my life,–that is, my time and interest and strength, and the gold and silver that measure these and represent them. Where is the sacred seven-branched candelabrum? Has the light of the sanctuary gone out? Is it dark in the Holy Place? Ah, no! For we, even we Christians, are to shine as lights in the world. Oh, not to let my light go out! Oh, not to hide it under a bushel! Oh, to tend it daily, with prayer and with a song!. It is indeed a cloud, dark and ominous, and it has settled down upon my life, forbidding progress. Why will the Lord hold me in this place? Why may I not break through, and speed on to the promised land? Ah, the Lord is in the cloud! If I break through it and go upon my way, it is my way alone, and His no longer. If God is with me, my voice shall be like the silver trumpets of Moses. By my words shall men come together and move forward. In the days of gladness and on solemn festivals men will take up the note I sound. And it will not be because it is I, but because it is God; and God will speak through any one else as gladly as through me. Whatever my lot, it is of the Lord. As direct as the manna from the sky, my fortune falls from the hand of my loving Father. And shall I complain? Shall I not rather rejoice? Whatever the day brings me, shall I not rejoice, since it brings me God? Shall I wish to exchange it for anything that will not be God? When I envy another his ability or position, or anything that is his, surely it is as a leprosy, eating both body and soul. Pray for me, O Thou Second Moses, Thou Deliverer of Thy people, first that I may see my plague, and then that it may pass from me. My Promised Land lies before me. It is mine, because God has promised it to me; and yet not mine, because I have not yet seized it. I have looked longingly at it. I have made faint-hearted excursions into it. But ah, the giants are there! They are big and strong, and I am weak and little; I am as a grasshopper. Alas, I forget Him in whose eyes all men, giants and pygmies alike, are but grasshoppers! There is a “too late.” There has been many a “too late” in my life. “Today,” when I might have heard His voice, has become “yesterday.” What is left for me? To batter my head against the closed doors, the doors closed by my own folly? No; but to walk with the Lord all the rest of my days, past or into whatever doors He may choose. Men no longer wear on their garments that cord of blue, but should they not all the more wear it on their hearts? Do I keep in perpetual remembrance God’s known will for me? How distinct are His commandments in my view? How do I go about the firm remembrance of them? When the Lord sets others over me, to authority, position, influence, or ability, am I not as Korah, Dathan, and Abiram? Do I not forget that men are nothing, to stand high or sink low, but God is all in all? Let me live my life to Him alone, in humility and self-distrust, and so let me escape the pit, the fire, and the plague. May my life blossom and bear fruit! Though dry now, and withered, send Thou the sap through its dead veins, quicken it without roots, vivify it without life, and make of it an almond tree, O God! Then will I lay up the marvel in my Most Holy Place, that I may give Thee praise forever. Be the Lord my portion and my inheritance! He will not be, while I seek any other portion or inheritance. All such seeking is an affront to His graciousness. It is proof that He does not suffice. But Thou dost suffice, O Father. By how many rules, and what minuteness of parable, did God’s own people need to be taught the necessity of purity! Not by their road, but by some road, however hard and long, I must reach the same end. My God is spotless purity, and I cannot reach Him while a hint of defilement rests upon me. Almost daily, almost hourly, I smite the rocks in my own strength. Every time I do this, I affront the Lord Almighty, I toss aside the teachings of my past, I play the fool. For if I should have learned anything from my life, it is that in myself I am nothing. Thus it is that I keep myself out of my Canaans. They surround me, stinging worries, poisonous doubts, crafty temptations, crawling iniquities, glittering sins. They assail me by day and night. They come up against me from the east and the west. I have no help but from the cross, and Him that was raised upon it. Oh, I will look to Him, and then I shall live indeed! My words are my self. As they are spoken or withheld, I live–to the Lord of heaven, or the demons of hell. Let me watch the doors of my mouth. Before I speak, let me look to the Lord. Let me not at any time utter my words, but His. So alone can I live not my life but His. Let me speak what pleases men or what displeases them, and let me not care, if only it pleases God. I will not harshly disregard my fellows, but I will not fear them. I will be kind, but not servile. One is my Master, and they are my brethren. 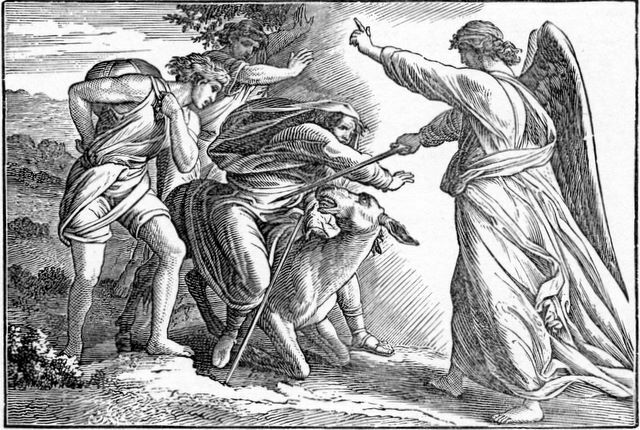 I, even I, may be such a prophet as Balaam, if I am such a hero as he was. To obedient hearts come inspirations. To worshipping eyes come visions. To courageous tongues come revelations. Thou dost know all mysteries O God, and I may know Thee! I would be red-hot for God! No half-hearted service shall be mine, no luke-warm enmity of evil. It shall be war to the knife, and the knife to the hilt. Oh, my carelessness, my lackadaisical sloth, my languid indifference, when the battle of eternal issues is on, and my Captain calls every soldier to the field! None left for the second numbering, save only Caleb and Joshua! Would I have had a place in that little roll of honor? Shall I have a place on the vast master roll of the divine Moses? Let me meet my giants daily with that thought ever before me. I should care less for my fame in my work than for the work’s success. Let me not seek to be remembered after death, but that my work may be continued; let me be more eager for my successor than for my eulogy. For what am I, O Lord, that Thou dost deign to employ me at all? What reminders did the Israelites need of the sacrifices, what earnest repetitions! Not because Jehovah needed to receive the sacrifices,–His are the cattle on a thousand hills,–but because they sorely needed to give them. And my offerings? Ah, do not I also need a myriad of reminders, and even then go to them languidly? Why should not my longing desires be my only law-book? Shall I say that every day is to be a sacred festival? Yes; but only as at stated times I observe due days of worship and thanksgiving. Consecration is born of habit, and habit is born of practice, and practice is born of system. I must be bound before I can be free. What are my vows to God? Are they only the words I take upon my lips? Are they not also the mercies I receive from His hands, the situations in which I allow myself to be placed, the whole tenor of the life I so gladly accept? And shall I hold myself only to the few petty obligations I seal with my tongue? I will have implacable hostilities. I will set my face like a flame against all that God hates. My war shall be endless and greedy against them. I will be a raging lion, a ravening wolf. There shall be no compromise, no quarter, for that which my God hates. Is my dwelling apart? Has my inheritance fallen in solitude? None the less does my duty lie in the crowd. The solitude is pleasant, but selfish. It will be a hell to me, though a Gilead, if I cannot carry to it the spirit of brotherhood. Well that the Israelites did not know, before they set out, how long was the way, how many were the stages! Well for us also that we have no prospectus of the coming years. God knows them all, and, if we let Him, will guide us safely through them all, giving us daily strength for the daily road. Praise God, I do not live in a time when men need an earthly city of refuge, with stone walls and an open gate! My refuge is always at hand, and needs no running to it. There is no doubt of my reception. Entered in, I am safe from all pursuers. For my city of refuge is the heart of Jesus Christ. How much of my life is not mine! How much has come to me without my toil or thought, from my father and mother, from neighbors and friends, from the patriots and saints who have built my church, my college, my nation! And my life is due in turn, in great measure, to these persons and institutions that have done so much for me. May I not alienate their right in me!